Communication always comes with a level of messiness and ambiguity. Even with the best of intentions and clearest of communication we can portray mixed messages, leading to misunderstandings or conflict. Add to that the array of communication platforms we deal with: meetings, email, G-chat, passing remarks in the hall, phone calls. The opportunity for miscommunications is introduced almost all hours of the workday. These miscommunications are at the root of distrust, misled beliefs, and conflict, especially in a corporate culture. While managing these issues may feel tedious, the long-term effects of glazing over unclear communication can be detrimental to employees—and the company as a whole. I wrote about a personal experience of this that occurred not at work but with my daughter. It highlighted the value of clarifying intentions. The fast story is that my then-6-year-old daughter had drawn a precious picture of a blue dog, and then she heard me say I didn’t like Blue Dog. Little did she know (and how could she? ), I was talking about a restaurant named Blue Dog I wasn’t fond of, not her piece of art. She carried what she heard with her for two weeks before she felt enough courage to ask me about it, and we quickly resolved the misunderstanding. This isn’t so far off from what can happen at work, is it? Someone says something we take to mean they are upset with us or disappointed in our work, performance, or attitude. Or, perhaps, it’s the off-color wording of an email, a quick hang-up during a phone call, or what feels like a dismissive lack of eye contact. Before we know it, we’ve crafted an entire story about one interaction. He thinks I don’t know what I’m doing, or She thinks all millennials are below her. This snap judgment festers, sourly affecting our mood, energy, productivity, and many other interactions throughout the day. Worse still, we may even use this information to expand our belief about the other person, swelling the problem. Brené Brown puts it like this in her book, Dare to Lead: Our default when we are in the midst of struggle and lack data is to make up a story that makes sense of what’s happening. This way of creating our own (often false) information allows us to self-protect. The natural confabulation of events that occurs is harmful to our own psyche, as well as to everyone around us. The truth is that, yes, it can be easy to misconstrue what someone says or does. But assuming and jumping to conclusions does nothing to resolve it. The key to maintaining a healthy work environment is staying in a place of curiosity. When something doesn’t seem right or fair, when you feel wronged, take steps to learn more. Ask questions, listen earnestly, and leave space for honest explanation. Believe that most people come into situations with good intentions; be understanding that sometimes our friends and colleagues have “off” days. 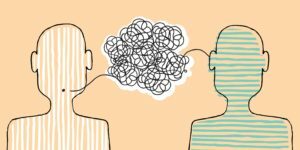 So much good can even come from a simple, “Would you mind telling me what you meant by that?” Not in an accusatory way, but from a place of wanting to understand where someone else is coming from, and really hearing and understanding them. Those who lean into the messiness and uncertainty of communication often find the most success and build the healthiest work environments. It’s not easy to be bold by calmly addressing miscommunications, but the reward is certainly worth it. After all, no one ever said you’d get anywhere incredible by sticking to your comfort zone.